Sign up for emails to receive 15% OFF and FREE SHIPPING! SIGN ME UP! 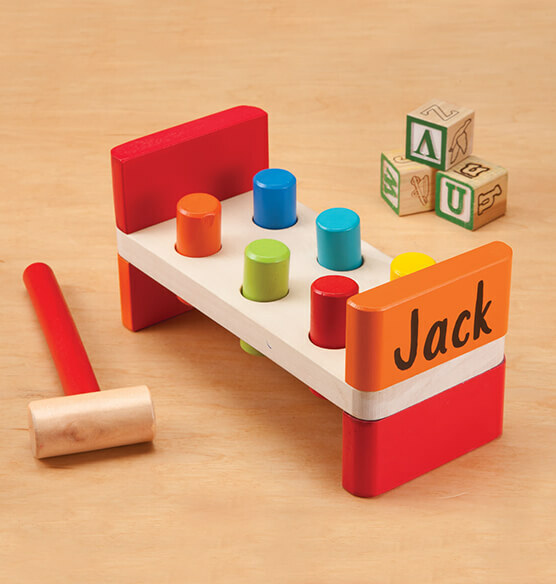 Classic personalized wood peg bench has been enjoyed for generations—and we’ll personalize this one for your busy little hammerer! Six brightly colored pegs go up and down, as your little one pounds the wooden mallet, then flips it over to enjoy the fun again and again. 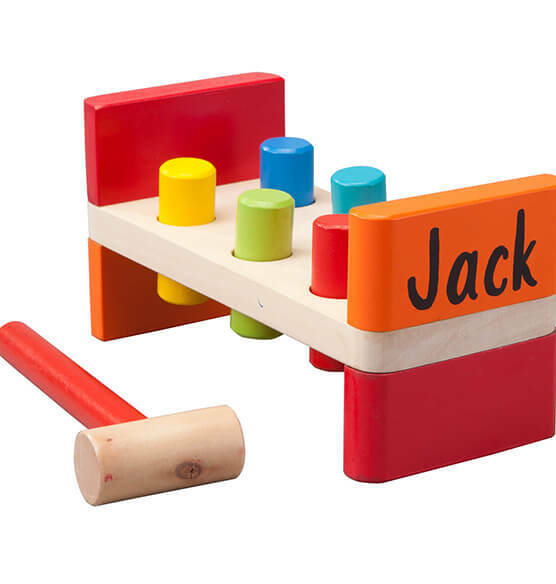 While engaging in active play with this wood toy, he or she will also be learning and naming colors, developing hand-eye coordination, discovering action and reaction, building fine motor skills and having a blast! We’ll handpaint with your child’s name, creating a keepsake gift. Specify name; limit 1 line, 10 letters/spaces. Bench: 9" long x 3 3/4" wide x 4 1/4" high. Mallet: 7 1/8" long. Pegs: 2 3/8" long. All in smooth, solid pine. Ages 12 months and up. We're sorry, personalizing this product requires Adobe Flash Player which is not supported by your device. To continue to checkout, click Add To Bag to login to your account. Your items will be saved to your Shopping Bag. You are adding more than 1 of this item to your bag. Would you like them all personalized the same? Christmas present for a little boy. He loved it. Will be use a learning tool for grandchild. I have had to order this Item 3 times because the spelling was wrong twice! I'm hoping to get the correct one tomorrow ...its for Christmas & your fault! The pegs were too small and slide right through the board. I did try the item two times so there is a defect in the production. Customer service was great and I got a full refund. Very disappointed in the peg bench. A couple of the pegs are too small and slide right through the hole. Sign Up for our emails and receive Special Offers and Discounts.